This turned out to be the bad guy. Perhaps you’ve never been to a live performance of an opera like Aïda or Lohengrin, but you have at least passing familiarity with the conventions of Grand Opera. If nothing else, you have heard Luciano Pavarotti singing “Nessun Dorma” on the music loop in your neighborhood Italian restaurant. When someone says opera, it creates a mental image for you: “The opera ain’t over ’til the fat lady sings,” maybe. Whatever your mental image, it is at odds with Beijing Opera (or Peking Opera, as it is also known). For one thing, Beijing Opera has no fat ladies. There are many other unique features of this theatrical idiom, developed by the Chinese in the late 18th century. 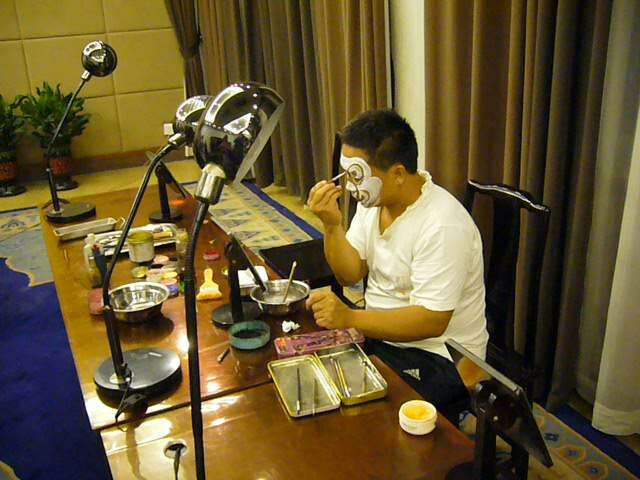 …After dinner we walked through the lobby, where the performers were putting on their elaborate makeup. (see photo) We were then escorted to a table in the theater that was perhaps fifty or sixty feet from the stage. There were some snack items on the table — peanuts encrusted in something was one choice; a bowl of what looked like limes (but were called oranges) was another. A young waiter had a tea kettle with a spout that was at least three feet long. He gave a showy performance of pouring hot water into our tea cups. The opera turned out to be unlike the version of opera we know. There were no arias or inspiring choral singing. The orchestra did not play what we would recognize as melodies. There were only eight or ten musicians, most of whom seemed to be playing percussion instruments. The others had stringed instruments, one of which looked something like a banjo. One scene featured a young woman (or someone who was portraying a young woman, anyway) who sang. “Wailed” might be a more accurate description; it was an ear-splitting falsetto that seemed to be conveying her dismay about something. Even the English-translation supertitles didn’t make clear what her issues were, but it seemed to have something to do with a sick husband, and her desire to obtain herbs that bestowed immortality. This entry was posted in Travel and tagged Beijing Opera, China. Bookmark the permalink.